Get your ringside seats for a once-in-a-lifetime collaboration with Heldeep Records “Heldeep Vs. Monstercat”, featuring ultra-stacked lineups on both sides! 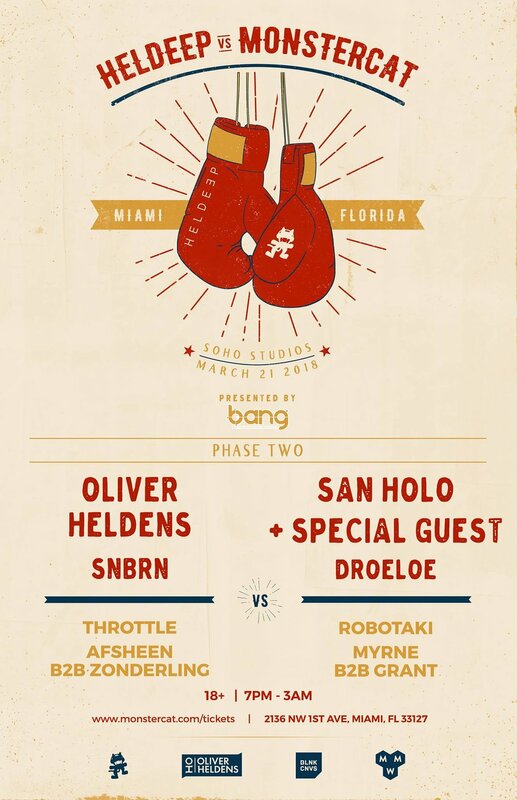 Heldeep Vs. Monstercat is coming your way in the heat of the Floridian sun at the world-renowned venue, Soho Studios! The bell will ring in the evening with a massive stage unlike anything you’ve seen before. We’ve done our training, said our prayers, and taken our vitamins; now it’s time to see who wins the belt. No matter what happens, it’s all of you amazing fans who will come out on top March 21st! 🔥 EARLY BIRD TICKETS: SOLD OUT! 🔥 GENERAL ADMISSION TIER 1 - SOLD OUT! 🔥 GENERAL ADMISSION TIER 2- ON SALE NOW!